With its warm weather, beautiful beaches, authentic food, and free-flowing sangria, the Costa del Sol has a lot going for it. While most couples head to Marbella, Jennie and R.B opted for an off the beaten path rustic villa wedding in Mijas. Where historic elegance meets modern and relaxed luxury. R.B and Jennie initially booked the Hacienda with Sunshine Weddings Spain without actually seeing it in person. The team had sent them numerous videos and photos so they knew what to expect, however the sheer delight on their faces when they saw the venue for the first time made it clear to everyone that they had made the correct choice. The Hacienda offers an unparalleled setting of lush, sun-kissed gardens surrounded by spectacular mountain vistas. 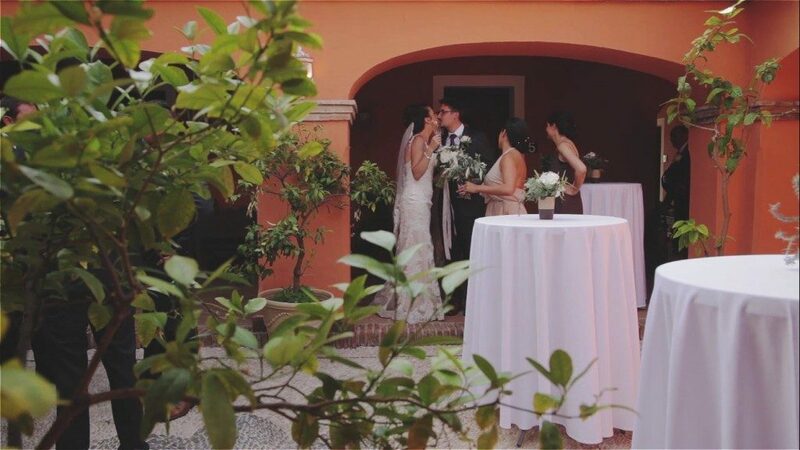 The traditional Spanish architecture and beautiful courtyards and gardens give this venue a classic and authentic appeal. On their first visit to the Coast, the couple from Orange County USA, stayed in the local town of La Cala de Mijas which gave them the chance to explore the local area and help them decide on final details. The celebration itself was to be a two day affair so there was a lot to organise. Scott was on hand to take care of every detail, helping to create a seamless and stress-free Spanish destination wedding. The plan was for the pre-party to be a complete contrast to the wedding day so, after looking at various options and venues, R.B and Jennie settled on a contemporary beach club with sweeping ocean views. Wedding guests from Spain and the US would be able to enjoy a modern and chic beach party which would be the warm up to the traditional Spanish wedding the following day. Jennie’s Spanish roots would play a major role in the wedding day. Not only was her father Spanish, she also spent her gap year travelling throughout Spain. On the big day itself Jennie was keen to let nature played a big part in the decor – as the garden would be in full bloom. Jennie had a very specific idea for her reception and the Sunshine Weddings Spain team worked extremely hard to bring that dream to realisation. Along with the garden style wedding decor feel, Jennie requested the unusual mixture of circular and rectangular tables for the wedding breakfast. They were then styled with crisp white linens which contrasted beautifully against the green foliage. Please look out for Part Two, where Jennie and R.B finally tie the knot.